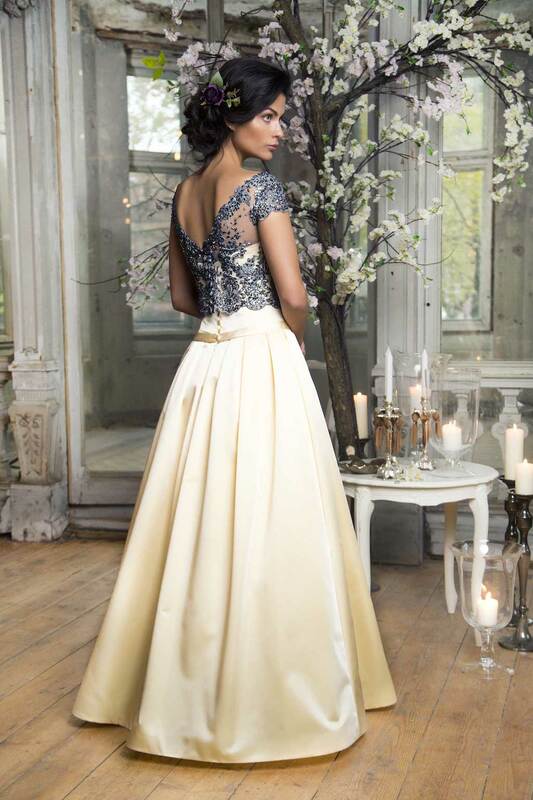 Grace is a distinctly feminine soft yellow tone evening gown that has a stunning A-line silhouette with strapless fitted bodice and skilfully flared princess skirt. This eye-catching Cinderella style dress is made from the finest quality satin taffeta fabric, and its waistline is splendidly accentuated with a matching ribbon belt. To give it a perfect finish, the back of the gown features a neat fabric-covered button row. For an exquisitely distinctive look this solemn model can be upgraded with a magnificent silver tone crop top. Its sensual bateau neckline and delicate hand-beaded illusion lace embroidery completes the dress beautifully.